Bonnie Farmer is an elementary school teacher, a children’s author, and a playwright living in Montreal, Quebec. Bonnie spent a part of her early childhood in Little Burgundy, the same neighborhood where Oscar Peterson grew up. She remembers its sights and sounds vividly and gets pangs of nostalgia each time she revisits familiar streets. Bonnie’s two most recent plays, Gollywog and Big Feelin’ have been work shopped at Black Theatre Workshop and Playwright’s Workshop of Montreal, respectively. Marie Lafrance is an award-winning illustrator who has been drawing most of her life. Her illustrations appear in magazines, posters, newspapers, billboards, board games, picture books and her own personal favorite, boxes of jelly powder. Recently, Marie has evolved her craft from painting with brushes to creating her wonderful illustrations digitally. She lives in Montreal, Quebec. Long before Oscar Peterson became a virtuoso jazz pianist, he was a boy who loved to play the trumpet. When childhood tuberculosis weakened his lungs, Oscar could no longer play his beloved instrument. He took up piano and the rest is history: Oscar went on to become an international jazz piano sensation. Oscar Lives Next Door is a fictional story inspired by these facts. 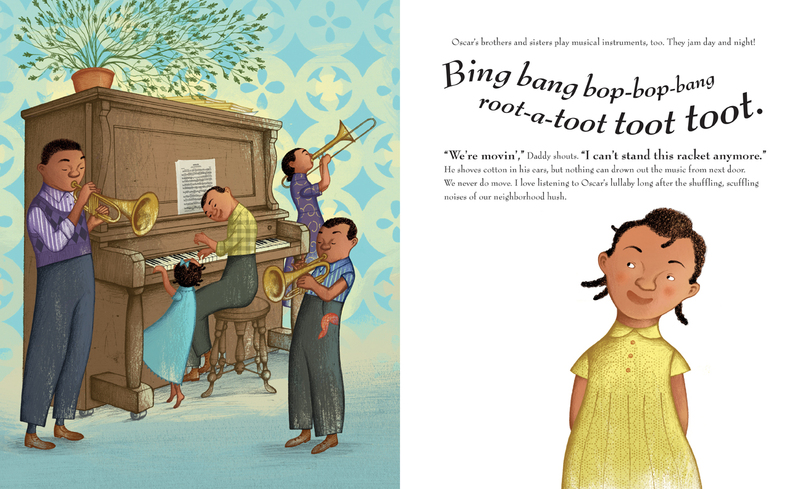 The book imagines a next-door neighbor for Oscar named Millie, who gets into mischief with him but also appreciates his talents: Oscar hears music in everything, and Millie calls him a magician for the way he can coax melodies from his trumpet. Millie writes to Oscar during his long stay in the hospital for tuberculosis, and she encourages his earliest notes on the piano. 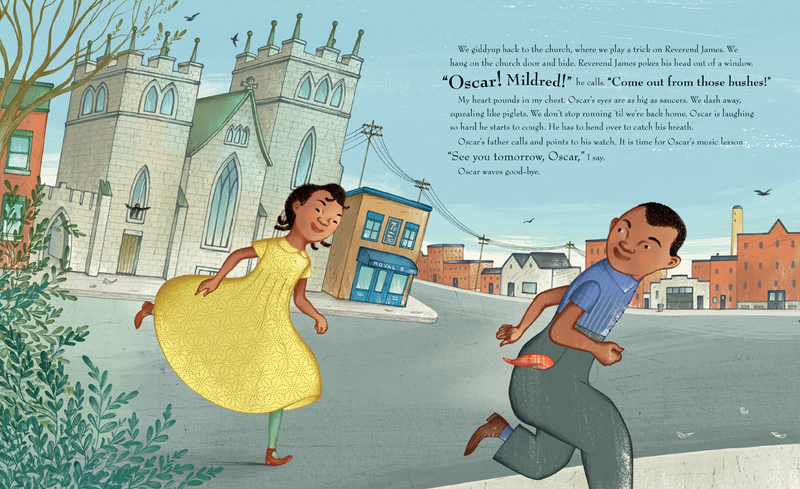 Set in Oscar’s true childhood neighborhood of St-Henri — now known as Little Burgundy — the book provides a wonderful sense of this 1930s neighborhood where most of Montreal’s Black working class population lived. Detailed digital illustrations make the community’s culture and music almost tangible. The book concludes with a page of informational text about the author’s own connection to Little Burgundy and a short biography of the jazz legend.